I first heard of J.Mendel when Kim Kardashian had wore one of their pieces to an appearance last year. I can't specifically remember what she wore, I have a feeling it may have been a black skirt or top, but she just wore it so beautifully, I had been keeping an eye on their collections ever since. Researching J.Mendel as a fashion house, there is so much background history into the brand which really got me interested. The brand was founded in the 1870s, and over the past years, has evolved into a beautiful global success under the influence of the creative director, Gilles Mendel. When founded in the 1870s, the brand was founded in St. Petersburg and had then moved to Paris following the Russian Revolution. It is a fifth-generation luxury house, meaning that the brand has been handed down through the Mendel family. It was in 1981 that the current Creative Director became in charge of the house. Gilles Mendel has been known to be so passionate about carrying on his families legacy with the brand, and judging by this collection and previous ones I have seen, he has done a beautiful job. 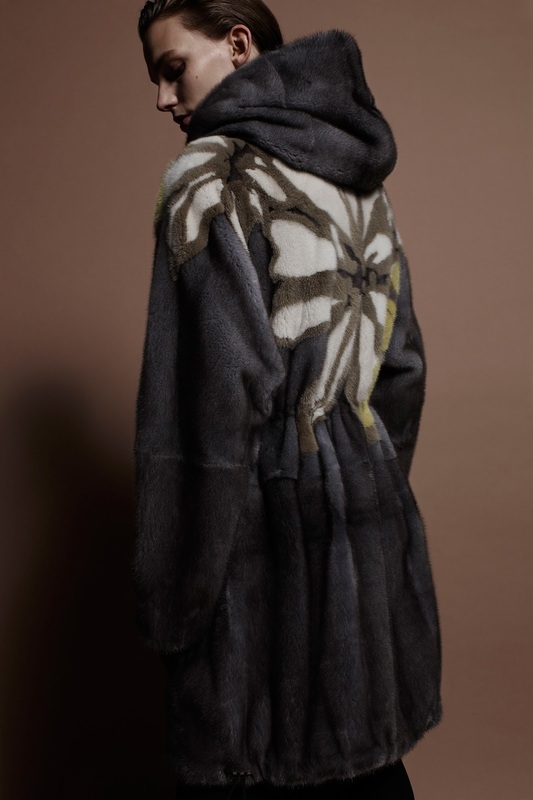 Gilles has been known for combining the highest quality materials and incorporating them into luxurious designs and had taken J.Mendel from a luxury fur atelier into a Ready-to-Wear brand in 2002. The impeccable craftsmanship that Gilles possesses is evident in his outstanding creations, and I for one, am now such a huge fan of his designs and collections. I feel that Gilles brings glamour to fashion. He always has glamour and beauty in mind - more is more and a woman feeling a million dollars is very important to him. He knows his clientele to a T, and is always produces pieces that he knows his clients will love and wear. I knew that, because the glamour influence is pretty much the foundation to the collection, there would be somewhat of a crossover between the day and night pieces. The collection was predominantly black - with a sense of femininity and luxury. Keeping the roots of the brand alive, Gilles had incorporated fur into this collection, presenting beautiful coats and fur trimmed leather jackets which were teamed with tailored trousers. I absolutely adored the A-line ruffled pin-striped dress, teamed with crisp white mules. I felt that the collection was executed perfectly and it has got to be one of my favourite collections so far. Towards the end of the collection was where the real glamour was presented in the form of beautiful evening gowns. Red-Carpet ready of course, J. Mendel wanted to give maximum impact but with a contrast of keeping it sophisticated, classy and soft. He leant on lace to help keep the looks fun, but added length to the dresses to create a a powerful piece. I loved it. Love your blog posts, they're always full of new information, very detailed and allow me to get to notice/know more about designers I haven't heard of before. This collection is beautiful and my favourite has to be the deep purple dress.